LOS ANGELES, Calif. – On a rare cloudy day here Jan. 30 supporters of the Raise the Wage Campaign, including church organizations, students groups, seniors, immigrant right groups, unions and labor leaders rallied at City Hall. 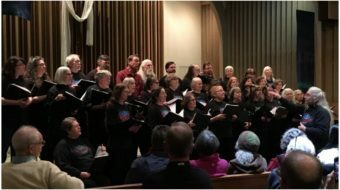 Hundreds of low-wage workers chanted “raise the minimum wage, raise the minimum wage” in support of a hike to $15 dollars per hour, as well as adequate sick leave and protection against wage theft by employers. The Raise the Wage Campaign has called for the community to support and help organize efforts to collect 100,000 raise the minimum wage support cards by going out and organizing on the grassroots neighborhood level, at the workplace, in the churches and over the last weekend, even at Super Bowl parties. Supporters are encouraged to register on the campaign website LAraise.org for information. The 100,000 support cards will help to put pressure on City Hall politicians to move on raising the minimum wage now, not later, organizers say. “Families need to be able to live, feed themselves and pay rent,” declared Gloria G., a McDonald’s worker. “Raising the minimum wage will only help families survive,” she said. “The time is now to raise the minimum wage.” Rusty Hicks, the new president of the Los Angeles County Federation of Labor, and Maria Elena Durazo, the former president of the federation, were at the rally pledging full support. Majority support for a living wage is reflected in moves by various cities to hike the minimum wage. 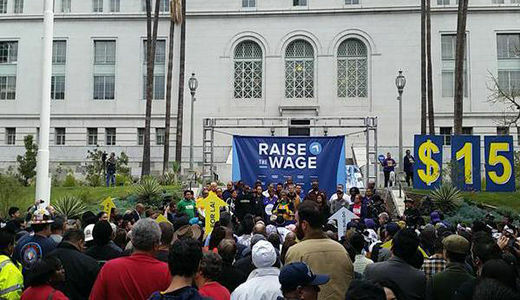 Los Angeles Major Eric Garcetti has introduced a proposal to raise the minimum wage in the city to $13.25 by 2017. On November 4, 2014 voters in Oakland approved raising the city’s minimum wage to $12.25 per hour by 2015. San Francisco moved to raise the minimum wage to $15 per hour.